The top 2 countries are unchanged from last year. In North Korea, Communist oppression has lead to thousands of Christians imprisoned in brutal camps. 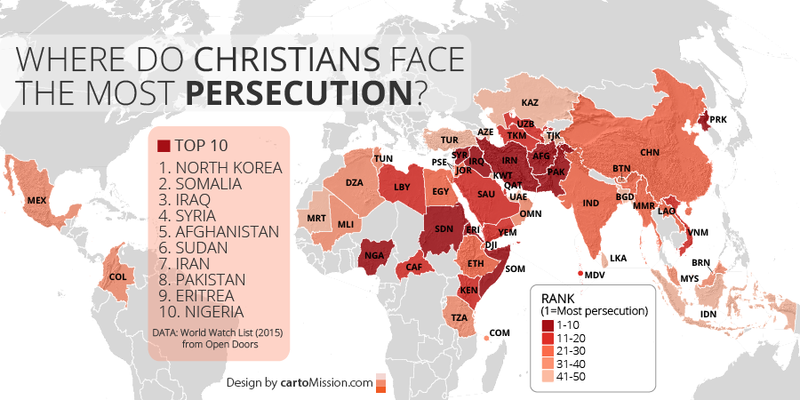 And, in Somalia, “Christian lives are targeted by Islamic terrorist groups, clan authorities and by some government officials.” The next eight countries with the world’s highest levels of persecution against Christians are Iraq, Syria, Afghanistan, Sudan, Iran, Pakistan, Eritrea, and Nigeria. This map shows the 50 countries on the World Watch List 2015, and several countries have moved onto this list from last year. In Mexico, organized crime throughout the country affects Christians as drug cartels target churches where they can extract funds or disrupt the rehabilitation of addicts. In the southern states of Mexico, community leaders uphold “indigenous traditional law” and threaten those who change religions (to evangelical Christianity, for example). Tajikistan and Indonesia also made the 2015 World Watch List, having not been included on last year’s version.